The Sichler family has been farming in the Rio Grande Valley for six generations — ever since the family patriarchs, brothers George Andrew Sichler and John Adam Sichler, immigrated to the United States from Germany during mid-1800s. 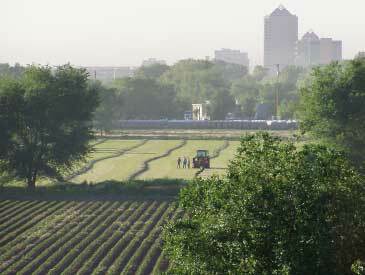 The farm had its beginnings in the village of Los Lentes, near what is now the town of Los Lunas, New Mexico. For the first few generations, the farm was comprised primarily of an apple orchard, vineyards, and other fruits and vegetables reminiscent of the family farm in Germany. In the early 1900s, Ernest and Edna Sichler became the first to grow green chile, the product that ultimately became the family’s hallmark. Today, members of the Sichler family continue to farm, and to provide residents of the Rio Grande Valley with superior chile products and other fresh produce. That’s why we call it a New Mexico tradition since 1869. In 1987, John and Eleanor Sichler, along with their two children, Naomi and Tim, entered the family business, opening Sichler Farms, Albuquerque — a store that has become a favorite chile destination for New Mexico locals and visitors alike. Now in its 24th season, Sichler Farms has experienced significant growth, while continuing to embody the Sichler mission and vision: A commitment to fresh, locally grown chile and produce, combined with a commitment to friendly, family-oriented service. Today, our product line includes a variety of fresh fruits and vegetables, along with other chile-related and Southwestern products — frozen green chile, dried red chile pods, a variety of chile powders, salsas, sauces, jellies, and more. In the years since they taught ristra-making classes and roasted chile at Sichler Farms, Naomi and Tim Sichler have grown, too. Naomi completed her undergraduate education in international relations at the University of Southern California, and now works as a consultant for various nonprofit organizations in the Los Angeles area. Tim, who played NCAA tennis for Boston University, holds a bachelor’s degree in business and works for an investment management firm in Boston. Jack Sichler caught the farming bug at an early age, when working on the Sichler family farm with his father Ernest. At that time, in the 1940s, the family had begun to grow chile, but their primary produce was still fruit, from their orchards’ apple and peach trees. Jack, though, was fascinated by chile, and after graduating from high school attended New Mexico State College (now New Mexico State University), where he studied horticulture and learned the intricacies of chile growing. Jack eventually returned to the Los Lunas area to enter the family business, and to expand the Sichler emphasis on chile. Over the years, as Jack’s farm grew in size and scope, he established a loyal market for his produce — including numerous grocers and restaurants — by consistently delivering the best quality and service. By the time he retired from farming in 2008 (he kept his promise to continue supplying Sichler Farms, Albuquerque, until Naomi and Tim graduated from college), Sichler had become a widely recognized name in quality produce. Following Jack’s retirement, his nephew, Scott, took over the Jack Sichler Farm and continues to supply Sichler Farms with fresh, high-quality chile and produce.